This version uses a simple always on LCD display in conjunction with a moulded lens in the shape of the original version’s turbine blades. The LCD would be constantly animated with a very simple two state animation which through the lens gives the impression that the blades are turning . When the Knob is pressed briefly the time scrolls across the top of the display and would stay on for 10-15 sec’s. When the knob is double pressed the time and backlight are activated. When the knob is pressed and held just the backlight is activated for illuminated animation. The knob can be pulled out like a conventional crown for setting the time, a date mode could also be possible. Hopefully this version will appeal to the same people that the original did, people who like gadgets and gizmos, toys, big toys, cars and planes etc. This design stands out due to its inspiration, always on animation and 3d lens. Also the range of special editions that could be available may make this design stand out. This entry was posted in Design Submissions, Watch Designs and tagged aircraft, lcd, LCD Watch, LED Watch, Mechanical, turbine, Watch Design Submission. Bookmark the permalink. ← Decypher watch turns digits into code. You’re welcome. It’s an awesome design. I’m not really an aircraft enthusiast, but these encourage me to take an interest. The Zero one is fantastic and the NASA one too – my favourites. The theme of having specific planes from history is great. Crikey my first TF comment, Thank you very much. The specific plane idea came from feedback from the original, Lance Davis asked for an A10-Thunderbolt version so here it is. The stealth one is my fave or is it the NASA one? Hey I just had a great idea based on this and the preview on TokyoFlash’s post on this! It’s like the turbine but the ends are cut off so it does like a LED ring, but seperated as if there was the turbine over it! Instead of having it turn why don’t we use that and find a way to read time like that? It’s similar to the RPM, but the middle is shaped like a crater for the turbine! Whoa whoa that would be a modle that is possible to make AND cool! You idea sounds interesting. Like a hybrid of this and the time telling method of RPM. great adaptation to a wonderful idea, i think this would sell like crazy to kids. Nice work Pete!!! Cool Pete or should I say “Q”. 🙂 Very glad to see this design on the blog. I like how you’ve recreated the effect of the blades turning. Nice and simple. I’m sure a lot of people would find this fun! 5 sets of turbine blades (*****) and yes! the effect looks pretty cool, awesome way to rework the design in a plausible way. not my taste, though, but neither was the first one. i won’t vote on this one, but i can see it will be popular with guys! good luck with it! Yeah I can understand this not suiting a Ladies taste, so thanks for not rating it. Diane liked the NASA one Pete. OMG I want the NASA one soooooo bad!!! I want you to have it too! Im glad you like it! Nice design, but I feel it is for a limited audience rather than TokyoFlash. Its more in line with the Click range of watches. What I like Pete in the draft, it is the dream that dominates, to have the hour, that’s fine, but with a nice toy. Yeah I know about the Perrelet watch, and it is very nice indeed. The main difference besides the fact that the Perrete is an analogue watch is that the Turbine element is a feature as apposed to a theme as in this case. There is also another digital Turbine based design floating about which aims to use the blades like a digital analogue. All of which have thier merits. The original reason for using the turbine theme was that I wanted to use a virtual floating display and needed the hub to spin, so a turbine was an ideal visual for that. Thanks Firfir, hopefully we will see the LCD version of Tricicrcle soon too. Simply awesome! This is very cool. I want the stealth one! 5* and Yes! Woooooow the turbiny flickering LCD is so cool *~* I also like the different aeronautic themes you made. This one or the original one – Turbine needs to propell our wrists 😉 Good luck for us, hehehe. 5*/YES without any doubt. Could you please moderate these links to the new animations or add the new animations to this post asap. I appreciate they may not influence the rating that much at this late stage but every little helps. I have added some new animations to my fb page PF Design of alternative time telling methods. Hopefully they will be added here soon too. Too many effects, some of the time is displayed! Hopefully the new time telling examples will be added soon. They include an analogue style display, a large digital display that uses the whole display and a RPM style display. Is the turbine alway turning the same way or switching side ? 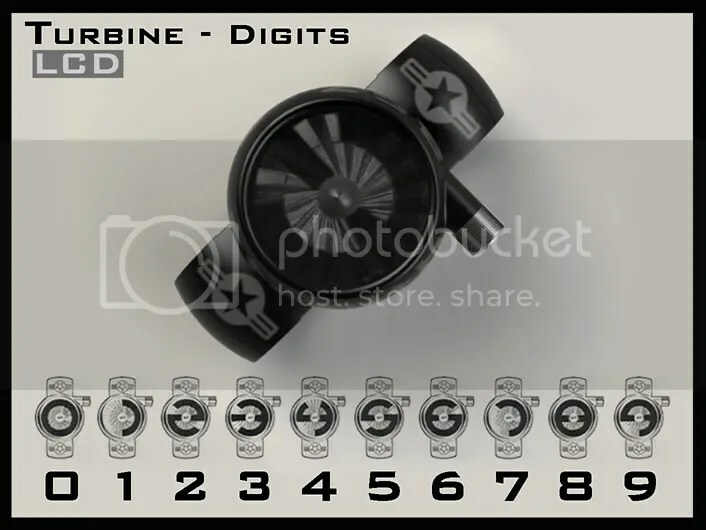 It would be nice if the color of the numbers was different than the turbine. The animation of the blades consists of just two images, your eyes trick you into thinking they are turning, if you look around the face clockwise it looks like they are turning clockwise and visa versa. You could backlight the areas of the dial in relation to the numbers which would allow them to be a contasting colour. Beside the speed (technical issue) and the RPM mode, I must say, good work! Can you show us the number set for the digital number version of your facebook page? I’d like to see them all. The analog one is cool cause it works with the turbine pattern. Yeah I’ll stick the page of the digits on my fb page tonight. They are running quicker than they did on my computer but you get the idea. The analogue is my favorit too. Hi i would like to produce it how can i do? i’ll like to produce it may i do it? I’ve to pay something? When you say produce do you mean purchase? i like to produce it and sell it by myself may i do it?? How can i do? As the design has been submitted to the Tokyoflash design blog, I would recommend that you contact Tokyoflash directly. if you give me the authorization i can make it by myself did u give me? I think it would be best for you to contact Tokyoflash, I dont know what their intentions are regarding this design. I would only buy if the wristband was a single color. Im sure if TF produce this design they would do a plain version. The original Turbine was plain (single colour) which is why I did more variety this time around. I like both the simple colour combinations as well as the more complicated ones. Thanks for the feedback! It’s nice when you can show multiple possibility for the wristband paint job. I should have mentioned that I don’t like military airplane and NASA & this is why I would buy a plain version. On second thought, the hurricane version is nice. I love the crown positioning. Two others ideas : a radioactive/biohazard symbols placed where the dot are on the F-ZERO version on a black wristband. This design does seem to lend itself to various colour combinations and I could imagine a range of special editions. Yeah a bio-hazard version would be cool, could have black and yellow warning hatchings in places. So many possibilities. If this design is chosen TF could have a poll/compeition where people submit colour/graphic designs for the finished watch! That would be sweet! I love the optical illusion created by the display under the fixed turbine. Im glad you like the effect, its very simple and could be allways on without using too much power.